^ Hoehling, One Man Air Corps, chs 5 & 6. 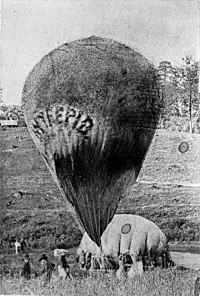 Lowe's preparation of a large balloon for a transatlantic crossing. ^ a b Centennial of flight Archived 2010年11月21日, at the Wayback Machine. ^ The whole incident is sorted and restated in Mike Manning's Intrepid, An Account of Prof. T.S.C. Lowe, Civil War Aeronaut and Hero on p. 25. ^ Block, Above the Civil War, pp. 100-101. ^ Block, Above the Civil War, pp.98-99. ^ Lowe's Official Report Part I. ^ Centennial of flight Archived 2007年10月25日, at the Wayback Machine.